I thought I should post the sale details again. They might get lost in the long list of posts. Everything in both Etsy shops and everything ceramic on my website is 25% off! Etsy sale…If you haven’t been to my shop before, you will notice my beads are different designs or color combinations than what is on my website. They usually come in a set or with coordinating beads. So if you are afraid of putting colors together, this is your place. For the next four hours you will get 25% of the price shown. I will credit the 25% back to you once I receive your order or you can wait for an adjusted invoice. The best part of Etsy is the beads are in stock. I will ship your order tomorrow. 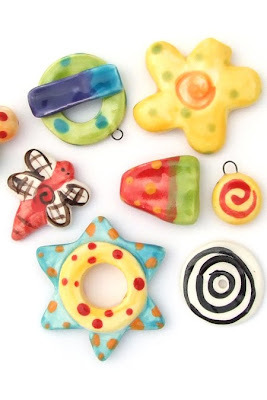 Jangles Website….Everything ceramic is 25% off, this does include kits. It usually takes me a week to get orders out if I need to make beads, I plan on making all the beads tomorrow for orders placed tonight, that way there will be a speedy quick turn around. You can always e-mail me if you are in need of beads by a certain date. I always try to get every one's orders to them when they need it. Jangles Emporium This is my newest Etsy shop and it wasn't here for the open house last year. I have packed it full of jewelry, bags, wall hangings, and gifts. Just the same as my Jangles Etsy shop, these items are all in stock and will ship tomorrow. So go ahead and look around…don’t forget I am here so by all means if you have a question ask away. If you have a wholesale account with me. please e-mail me for the detail's of your sale. I am sorry I can only offer these discounts to orders placed this evening, not on previous orders. Make sure to keep checking back to the blog. I will be posting new posts all night long…next post is about the door prizes and it will be coming soon. I am always happy to combine orders between Etsy shops and Web orders to save you shipping costs. You don't even have to remind me, If there is more than one order from you you can assume that I will combine them and charge you the least amount possible.